George Hartpence acts more for love than a living. His full-time job is as a director of pharmacy for a major corporation. Yet he appears several times a year to give a professional sheen to some of the worthier community theaters in Bucks County and middle New Jersey. ActorsNET is a home of sorts to Hartpence, who is a Founding Member of the venerable Morrisville, Pa. theater. He not only performs at ActorsNET. He directs, designs, and pitches in for construction, painting, and technical work. A man of the theater, one might say. “My Favorite Year” may have gotten short shrift when is appeared at Lincoln Center in 1992. It is more a mild musical in the earlier ’60s style — think “Do Re Mi” or even “Bye Bye Birdie” — than a piece that’s going to dazzle you with its music or book. Like many of the current musicals based on movies, “My Favorite Year” is solidly middle-of-the-road weaving a domestic story about a nerdy neophyte writer, the one who is having his favorite year, with the more interesting and dramatically exploitative setting of a major television broadcast and the appearance of Alan Swann, an Errol Flynn-type that became a matinee idol in adventure films that included more than a soupçon of romance. The problem I see with shows like “My Favorite Year,” which has a score by the estimable Lynn Ahrens and Stephen Flaherty and a script, based on Dennis Palumbo and Norman Steinberg’s screenplay, by Joseph Dougherty, is it’s old-fashioned entertainment, as can be found in many a current television sitcom, in a $160-a-ticket world that expects more creativity and theatrical effect for that kind of money. “My Favorite Year” is, after all, primarily a situation comedy given an extra measure of curiosity by featuring characters who represent TV icon Sid Caesar and movie star Flynn. Dougherty’s book is Neil Simon-like, centering around a whiny Jewish boy who may or may not have talent and his entertainingly wacky family. It works best when it leaves that boy and his family behind to concentrate on the making of TV’s “King Kaiser Cavalcade of Comedy” or the suave, but self-destructive traits of Swann. At ActorsNET, this is especially true because of the performance of George Hartpence. Others such as Susan Blair, Susan Fowler, and Steve Pié contribute to the spirits of Cheryl Doyle’s production, but it is Hartpence who dominates and galvanizes it. That’s because Hartpence measures his portrayal so much. While he can be quite convincing as a drunk or a man who can walk out on any commitment, be it a daughter who wants his attention or a TV contract, Hartpence endows Swann with class, breeding, and savoir faire rather than bombast. This is a man whose time of wealth and Hollywood stardom has cultivated him. He may give in to self-indulgence, but he is not crude or sloppy. Hartpence’s Alan Swann is a gentleman. His experience with the equally famous, and the honesty he gave his screen characters, have endowed him with finesse that is more than a veneer. The man is downright charming in a way that reminds more of Douglas Fairbanks or William Powell than even Errol Flynn. This is a Swann who cannot be ruffled and always has the good nature to be polite. Hartpence show Swann’s larger than life side while also humanizing him and making his accessible. This Swann can enjoy dinner at Benjy Stone’s — shades of Sondheim’s “Follies!” — family apartment in Brooklyn. This Swann can reflect or shortcomings and convey shame and fear of not coming up to the mark as a father as reasons for not seeing his daughter, as opposed to being indifferent, too big to care, or beyond such sentimental nonsense. Hartpence knows just how far to go out of control as Swann to create suspense on whether he will or will not fulfill his commitment to be King Kaiser’s guest star and do a swashbuckling Three Musketeers sketch on his program. He lets you see Swann’s thought processes, including the battle between the one who calls all shots and the one who doesn’t want to let everyone down…again. Hartpence conveys Swann’s size in his bearing and mild swagger. He doesn’t have to exaggerate the man or do anything hammy. In fact, he resists it, and the effect when Swann seems poised to disappoint is all the greater because of it. Vocally, physically, and philosophically, Hartpence’s Swann is a gem. He even masters pratfalls, inebriated faints, swordplay, well designed by Mark Holbrow, and a fairly spectacular entrance gambit given the ActorsNET’s tiny quarters. As in the movie, Swann makes his first appearance flying in on a rope. ActorsNET is a little too compact to manage that feet, but Doyle makes creative use of her theater’s infinitesimal fly space and has Hartpence arrive on a kind of weighted device that allows him to soar on set from above. The execution is a bit herky-jerky, but its effect is buoying if not thrilling. It certainly conveys the derring-do Dougherty’s script calls for and makes one admire Doyle’s ingenuity. That ingenuity comes into play in managing “My Favorite Year’s” several locations, at least ten, and their furnishings. Doyle came up the efficient idea of using the same chair but covering it with different fabric to indicate Swann’s Waldorf suite and Belle Steinberg Carroca’s Brooklyn living room and changing background curtains to match the fabric on the chair. It’s elemental, but it works. 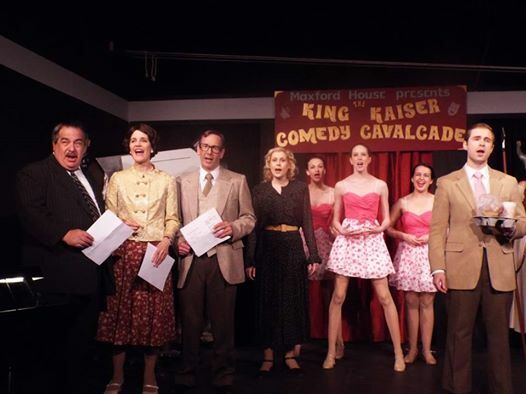 “My Favorite Year” has bright spots, such as when Susan Blair, as writer and former King Kaiser vaudeville partner, Alice Miller, commandeers, by prior agreement, a comedy sketch she’s doing on the air with Kaiser and goes for broke with her extended cameo in “Professional Show Business Comedy,” one of the funniest and best conceived production numbers for any show. Blair shows panache as she takes center stage and makes the most of Ahrens’s witty, informed lyrics. The number earned a Tony for Andrea Martin when she originated the part in 1993, and it was a treat to see it one more time, and in the hands of the capable Blair. Doyle’s production for ActorsNET is always efficient and well-paced. Its quality varies scene by scene depending on who is center stage. Scenes in Kaiser’s writer’s room or rehearsal space can be hectic. They have focus, but they happen so quickly, you don’t hear every line or catch every gag. The cast is natural, but at times, a laugh line is pushed, Hartpence, Blair, Susan Fowler as Benjy’s mother, Steve Pié as his stepfather, and Marco Newton as his Uncle Morty have the best time with their parts and seem natural even when they’re immersed in shtick. Alex Smyk is most successful in book scenes as Benjy, Dougherty, Palumbo, and Steinberg aside, he is from the Neil Simon canon of young Jewish male narrators and a bit of a stereotype. Smyk lacks the ease and chutzpah, even misplaced chutzpah, to be natural as Benjy. You see the actor all the way, but he is a good listener, especially to Swann, and he lets you see the tension he is under. Time might make Smyk’s performance looser and, perhaps, a tad more cocky and assured. His stiffness causes of bit of strain in musical numbers, and though you can hear his voice is good, Flaherty’s score seemed pitched high for his comfortable register, so there is some forcing of top notes. Hartpence accommodates the innocence Smyk conveys. He’s almost fatherly to the lad, whose own father deserted his family, even as he warns he too might break his heart by fleeing instead of facing a live studio audience. 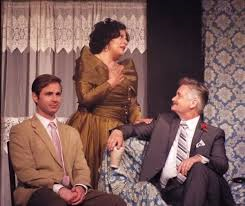 In her ’50s dresses and make-up, Susan Fowler resembles Lainie Kazan, who played Belle in the 1982 movie and the original Broadway production 10 years later. Fowler gives Belle just enough characterization to show the middle class Jewish mother of 60 years ago. You can see her kvell at Benjy’s achievements and feel honored to have Alan Swann as a dinner guest. Fowler, like Hartpence, retains some humanity for her character as well. You believe Fowler even she’s calling a television studio five minutes before air time to talk about cake. Steve Pié has a small, one-note part as Rookie Carroca, but he endows it with lots of personality. The way Pié shrugs to show he’s never going to win against Belle or get a word in edgewise, and the way he constantly has to correct the mispronunciation of his name by even Belle and Benjy, is a study in when enough is plenty. Pié is so good at modest subtlety, you turn to catch Rookie’s reactions to thing because they’re usually familiar and funny. Steve Lobis has the right temperament for King Kaiser, a star who has superstitions and traditions he insists are upheld. He barks here, appreciates a good joke there, and goes about his business, but Lobis never makes Kaiser the center of attention. Whether it’s among his writer or while contending with the formidable Alice, Lobis’s Kaiser seems to blend into the background and play second banana. Surprisingly, blending Kaiser into the ensemble works well enough. Swann, Benjy, and Belle are leads enough. Singing seems to relax her and make K.C. seem less officious and guarded. In acting, Rzasa can fade into the set and wait her turn to deliver her line with meaning but not much personality. I think she will acquire more ease as she continues to act. Doyle’s direction is solid throughout. Whether the polished performers or a less sharp ensemble is on stage, “My Favorite Year” moves breezily and maintains the right comic tone. Scenes in Belle’s Brooklyn apartment play exceptionally well, combining humor and realism effectively. Best, though, is the way Doyle gives Hartpence leeway to be a gentler, more considerate, more amused Swann who can muster bravado and cause calamity when he chooses, but in general is a man who mastered his Warner Brothers manners but necessarily his fears and alcoholic cravings. Doyle and Hartpence have proven time and again to be good team, and “My Favorite Year” is no exception. As set designer, Doyle proves resourceful in using the same basic pieces under a variety of covers and groupings to keep “My Favorite Year” flowing. Kudos to Peter de Mets and his small but versatile orchestra. “My Favorite Year” runs through Sunday, June 14, at ActorsNET, which performs at the Heritage Center Theatre, 635 N. Delmorr Avenue, is Morrisville, Pa. Showtimes are 8 p.m. Thursday through Saturday and 2 p.m. Saturday and Sunday. Tickets are $20 with discounts available to seniors and WHYY members and can be obtained by calling 215-295-3694 or by visiting www.actorsnetbucks.org. This entry was posted on June 11, 2015 by nzoren in Theater Reviews and tagged ActorsNET, Alex Smyk, Cheryl Doyle, Comedy, Elizabeth Rzasa, George Hartpence, Marco Newton, Mark Holbrow, Morrisville Pa., musical, Philadelphia Theater, Steve Lobis, Steve Pie, Susan Blair, Susan Fowler.